Προγράμματα > Act it out! Act it Out is a european Training Course (TC) for youth workers and professionals that work either in the area of youth theatre or of human rights education, or in both. The aim of the TC is that of giving support in starting a new thematic of youth exchanges that would promote the defending and promoting of the human rights, the fighting against discrimination, racism and xenophobia through the street theatre, and that would develop the participants/ competences (knowledge, abilities and attitudes) of combining these two working areas that are almost never put together in training projects of European dimension. The main theme is the development and improvements of european youth exchange projects and specifically those exchanges whose objective is the fight against racism, discrimination, xenophobia, as well as the defense and promotion of human rights in general. 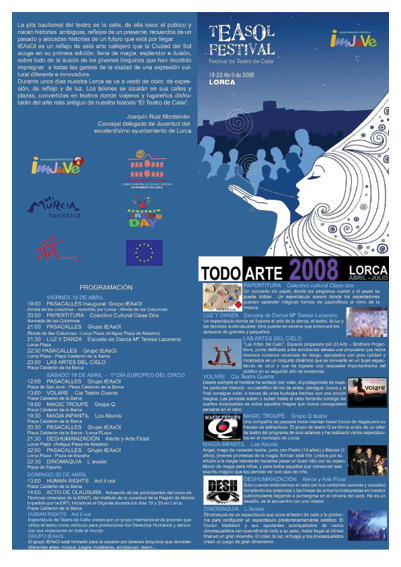 The TC will be held in Lorca, Spain during the first National Street Theatre Festival in Lorca. 4. Analyzing the characteristic of street theatre as a methodology of socio-educational intervention and as a tool of sensibilization against discrimination, racism and xenophobia for the actors as well as for it/s target audience. 5. Exploring the way in which when the street theatre is used in order to defend and promote the universality of human rights and in youth exchange contexts it acquires a unique value for working on values, attitudes and social skills with youth. 6. Consolidating the learning of the youngsters of street theatre and human rights by setting a performance specially designed by them that would be performed during the 1st National Street Theatre Festival that will be held in Lorca during the TC. Morning General rehearsal of the Act It Out performance !